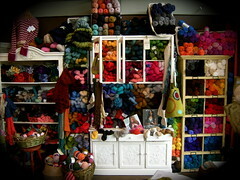 Ever since I started to work at the yarnshop CloseKnit on Alberta Street last Summer, I have been contemplating writing about it. I decided not to, but Frank’s death made me come out of the “CloseKnit closet”. On a much lighter note, more and more I feel the need to write about snippets of my working days at CloseKnit. So from now on, every once in a while, I will write about the beautiful people and beautiful yarn I have the pleasure to interact with at CloseKnit. I was so happy to be going to work again after being ill for several days! Last Friday was my first day back and allthough I had a slight headache during the day, I thoroughly enjoyed being back at the shop and being surrounded by an abundance of yarn. It was a steady day at the shop, customers browsing and petting yarn, a knitting question here, and crochet question there. I was pleased to see one of our regular customers called Gail, with who I always have inspirational conversations. Every now and then, Gail treats us with a cup of tea from the Teashop and so she did last Friday. While I was enjoying my tea, I watched Gail and some other ladies browsing through all kinds of yarn. Every single one of them was enchanted by all the soft and squishy yarns and they all were in their own little space, dreaming about future projects, I bet. Then, suddenly, one of the ladies made a loud sighing sound as if she just fell in love with an adorable little skein of yarn. All ladies looked up from their own thoughts in recognition; don’t we all sigh like that once we find that perfect one little skein? Whereas just a minute ago, everyone was in their own little space, now everybody started to talk to each other, showing eachother this and that yarn, this and that book and sharing yarn stories. Me? I was still sipping my tea, and as I watched these ladies bond with eachother against the backdrop of an abundance of yarn, I truly felt happy and smiled. I haven’t been knitting much due to having been not well this past week! My brains are still a bit of a mess, so patternwriting is still on hold. Instead, I managed to knit another Portia hat. This Portia hat is for a young lady named Kassandra who first came into the shop several months ago. After helping her at the shop several times, we started to chat and I soon found out that Kassandra is a hairstylist. Tomorrow is my hair appointment and I am going to ask Kassandra if I can take a picture of her wearing her Portia hat! My brains are entangled. I first noticed the shape it was in when I couldn’t understand what I had written: k1, p1, k1, b.o., p1, sl 1 st, psso. My handwriting started to make no sense to me, and even worse, I messed up my knitting. This paired with a sudden heavy headache, itchy eyes, coughing, runny nose and sore muscles…oi, methinks hayfever and the flu have gotten the better part of me. When one’s brains are entangled, one cannot patternwrite, nor knit. Just some blogging will do. Lately, I have been seeing some pretty cute tops walking around in the Bubblehood. When I see a lady wearing a cute top, I so want to walk up to her and ask if I can please shoot a picture but I am a bit shy and afraid she will think I am some freak. Excuse the blurry picture, we will have to do with it I am afraid. 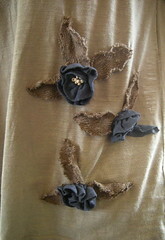 See how knitting crochet and sewing are incorporated in this piece? And the cute flowers… just look at the knitted leaves. Cute. Very cute. See, I want to learn how to make something like that. Knitting, crochet, sewing, yarn, fabrics, garments. I want it all! But where to start..? Yesterday, I listened to a back episode of the podcast called CraftyPod by Sister Diane. In episode #55 called: “Sew your own clothes with Amy Karol“, Sister Diane interviews Amy, writer of a sewing blog called Angry Chicken. To me, little knitter wannabe sewer sometime soon in the near future, it was a very interesting interview. Of course as soon as the interview ended, I had to head on over to Amy’s blog. While perusing her blog Angry Chicken, I found yet another blog and people, I fell in love over there with an apron pattern called Emmeline. I so want to try this pattern. I have no clue where to start and what to do but I guess, being encaptured by a design is the first step, eh? By the way, make sure to check out Meg’s wonderful blog called Sew Liberated. She designed that adorable apron Emmeline and over there you can find a link where and how to purchase the pattern. I want to knit so badly but I am afraid I am not feeling well at all. This makes me realize how much I need to do something with my hands. Create with my hands, feel the movement of creation. Isn’t it wonderful how we can create so beautifully? We can think about creation, dream about it, get inspired, make a plan, get tools and materials and simply create…I love it. But for now…it’s out of my hands… I just got to chill and take it easy. After I posted “a Day in the Bubblehood” a few days ago, I received comments from 2 knitters (Vanessa and Marianne) who told me that often times they knit in solitude. Their comments made me pause and transported me to a lonely time in my recent past. I realized that loneliness and solitude where my two best friends just around the time I learned how to knit. In fact, in my loneliest moments, I picked up my knitting needles for the first time. This was only 2 years ago. I chose to knit back then, because I was lonely and needed something to kill time with. And oh, what a sweet sweet choice it was. More over, I would have never imagined that knitting would bring me so many friends and even a job in a yarnstore! Anyways, today I would like to share some links with you. Links to blogs and a podcast which have kept me company during my loneliest knitting moments. This wonderful production by knitter Brenda Dayne is done so professionally! From the very first moment I heard her show, I was simply hooked. I very much enjoy her beautifully written essays, her sweater stories, the music that she plays and just… just… well everything! This is one of my all time favorite knitting blogs! I would go and see what Eunny was up to every week. 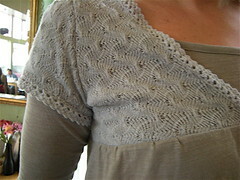 With her work, Eunny encouraged and inspired me to knit lace. I love her elegant style and feminine touch. Eunny does not blog anymore though. She became the editor of Interweave Knits! But her blog is chockfull of good information and tutorials. I found Anne Hanson’s blog called Knitspot way back when I asked for help in the forum of KnittersReview. I found that Anne is a wonderful knit designer and she is so incredibly nice. Every time I would leave her a comment, she would write me back. I really became very fond of her. I think she’s a very classy lady. To visit her blog Knitspot, click here. When I was a very newbie knitter, I would go to Amy Finlay’s website knittinghelp.com all the time! With her tutorial videos, Amy demistifies all kinds of techniques! I learned so much from her and I ocassionally would ask questions in the forums. Go give knittinghelp.com a try by clicking here. 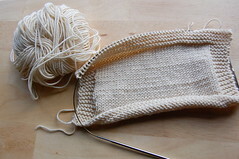 I got so many nice tips and great help in this website called Knitter’s Review by Clara H. Parkes. I would especially hang out in the Lace Forum and everybody treated me so well. Not once was I laughed at by my silly questions. Every single knitter in that forum has been extremely kind and helpfull to me. Click here, to visit Knitter’s Review! Ever since I have started my own blog, I have had the pleasure to meet many other bloggers. To name a few: Blackbunny is Knitting, Knittoo, Languidly Knitting, The Bag Lady and the Pro, Westerly Whimsies, Finding my Knitch, Wild Hare and so much more!!! 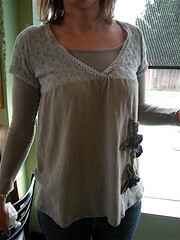 Life Happens Be Positive by Toya, Real Life: Live & Unscripted by Adrienne and Couture and Tricot by Tany. And last but certainly not least, lately I have been listening to Sister Diane’s Podcast called “CraftyPod”. Sister Diane shows me that there is a whole lot more than knitting out there in the crafty world. I simply love her shows. As for knitting in solitude, I still do that often and I kind of like it. I love hanging out and share ideas with other crafters but I very much appreciate my time alone too. I guess I have always been that way. In a world where everything goes so incredible fast, I like to take my moments of slow pace. What better way to start my day off with an early morning walk? As the sun is climbing I slowly get ready for a peaceful stroll in my neighborhood which I lovingly nicknamed “the Bubblehood”. At the slow pace of walking I am able to enjoy certain visuals, and I find little treasures which on a fast pace, would have been hidden from me. 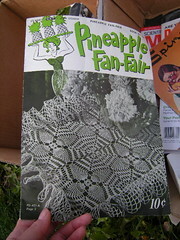 One man’s trash is another man’s treasure, in this case a vintage crochet magazine called “Pineapple Fan Fair”, oh goodies! I love it when people place a “free box” on the sidewalk! I soak up the early morning energy and glowing like a little kid who just found a treasure, I make my way to the Teahouse to do some patternwriting for a little bit. I always enjoy the serenity at the Teahouse but what I also very much enjoy are all kinds of different art that is displayed against the walls. Meet the Urban Princess by photographer Keith Buckley… I think she’s beautiful and so very colorful. Under her watchfull eyes, I start working and hope she approves this knitter’s creations. No planning, no fast pace, no deadlines, no workschedules, just waiting for the day to unfold itself before me is so special. Before I know it, I find myself visiting my friend Chayo and we have inspirational conversations about arts and craft, the medium clay, knitting, notions and blogging. 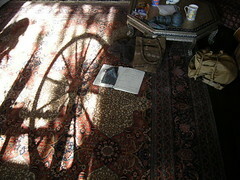 While I work on patternwriting, I see how the sun casts a shadow of my friend’s spinning wheel on the magical Persian carpet. I pause from patternwriting and stare at this beautiful visual. As Meli stops her wheel to check if the plying of her yarn is going well, I feel the sun on my cheek and feel so very thankful. I am making some good progress on patternwriting the choli. I am enjoying it still, all thanks to the yarn (Sirino by Great Adirondack) I am working with. I write everything I do meticulously in my little black book, come take a little peek! What can I say..? I am a slave to knitting. It has been a little over 2 years since I first picked up knitting. I vividly remember my very first yarn I bought and I wrote about it way back when I just had started this blog. Over the past 2 years I have absorbed knitting knowledge like a thirsty sponge. I found myself buying all kinds of yarns, needles, notions, patterns and books… so many books! I have been extremely focused on knitting and all there was to learn about knitting and yarn. Sure enough, several months after I learned how to knit I even knitted my own little fingerless gloves. And soon after that, I started to write out my little glove patterns. I have explored lace knitting, sock knitting, sweater knitting, intarsia and cables. And as of late, I am very much drawn to paper… that looks like fabric. Uh-oh… I am in deep deep trouble… I can already see a paper stash and a fabric stash growing in my yarnroom! What is a crafty gal to do, eh? Without exactly knowing where this all is leading to, I can say this with certainty: all of these mediums, yarn, fiber, fabric and paper make me happy. It truly lifts my spirits when I set eyes on these wonderful, wonderful materials. And I am going to focus on that what makes me happy and I am going to pursue that what ignites passion within me. A few days ago, oh lucky me, I had a facial over at Ruby Violet’s on Alberta street. I had been looking forward to this treat for weeks and literally ran to this cute little tucked away spa. I had a hard time getting up from the massage table…I stumbled to the hallway and told Sarah I needed a few minutes to get myself together. I sat down on the bench for a few, had a glass of water and then… oh my word… I felt how my whole being was lifted like a hot air balloon. As I walked out the door, my feet barely touched the ground and I got lifted higher and higher. I floated my way to the Teahouse, planted myself in a comfy chair, took off my sandals and just sat with my eyes closed in Lotus position. About an hour later, when I finally was able to open my eyes again and return to earth, this girl smiled at me on her way out and said: “I was watching you meditate in your chair and said to myself now that lady is in a place of bliss”. During an early morning walk, I stumbled upon this beautiful pink tulip. She was covered in dewdrops and her presence stopped me in my tracks. 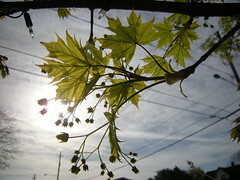 More than anything I was encaptured by the dewdrops which reminded me of glass beads. 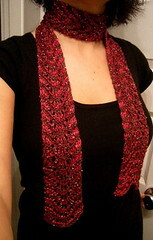 Immediately, a luxurious little skein of Artyarn’s beaded silk in my stash came to mind and I hurried home to fetch it! As soon as I arrived at the Teahouse, I promised to work hard on the choli pattern and as a reward I then could work on my beautiful beaded silk! Also, I finished my little Koigu Crepe Seattle glove… I just love the colorway. And the choli is doing well too! Pattern writing is hard work but also one of the things in knitting that really sets me in a trippy/geeky technical mood. 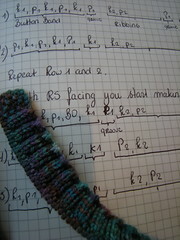 All the knitting codes and little drawings… so geeky… LOVE THAT! Yup, you guessed it right: it’s again the old Feather and Fan stitch! I am excited… very excited… about this. What I am going to do with it? Dunno yet. I am sure something will come up. For now, I will just let it mesmerize me. 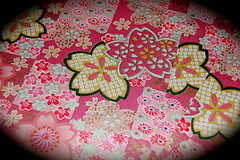 Swatching and scouting magazines for patterns that interest me is what I have been doing last week… other than that, work and being a social butterfly has totally consumed me! Allthough I am busy, I can honestly say, life is good. 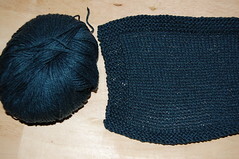 I have been swatching with some Classic Elite Wool Bamboo (see picture above). 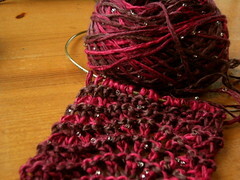 Delicious, nice stretchy yarn with a wonderful sheen to it. I am thinking a cute tanktop for spring or some nice lounge top to wear just at home. This design I found in Debbie Bliss’ Alpaca Silk Patternbook. Now that makes me heart go pitter patter! Finally, finally, finally, I thought it would never arrive this beautiful Sunday! I went to the Teahouse and did nothing else but knitting, knitting, knitting. I know I have lots of unfinished objects lying around, but really, this is not the time to focus on that. This is the time to cast on new projects, oh heavenly bliss, and enjoy the beautiful colors of the yarns I am working with. What I am making with it? A choli… Those of you who have been bugging me for my choli pattern may be happy to hear that I am finally going to write out the pattern. Say what..? Come again..? Are you asking me if I will issue my choli pattern for free? This pattern took me a long time to make. And the whole process of pattern writing is a lenghty one and takes a whole lot of energy, not to mention the many hours of knitting, ripping, and re-knitting. The company Sarisafari has expressed their interest in this pattern and I have decided to work with them. Hopefully, in the future, this choli pattern will be sold through them. You are currently browsing the Getting Purly With It blog archives for April, 2008.